* Unlimited Use to Match your AICPA Notice to Schedule - Course Access can be extended to 24 months if needed. "Phil and Yaeger CPA review provided excellent material to prepare me for the CPA exam. All the training was directly related to the exam and relevant topics. I would gladly recommend the learning materials to future CPA's." -C.K. "Yaeger CPA Review is the best value on the market right now. The video lectures did a good job of teaching me what I needed to know without including unnecessary information." -B.S. Watch video lectures like never before with in-depth textbook and content synchronization. These comprehensive videos will cover every aspect of the exam you will need to know. Our CPA review instructors will give you an in-depth look at the knowledge and implementation of materials you will be tested on. Use the quiz generator to create custom testing which allows you to give some final tweaks to your individualized CPA Review Platform. Make sure you are being challenged in the ways you want, review specific aspects of the exam, and have unlimited access to customized tests! Guarantees you have access to all the specific testing you want. Dive into Our Incredibly Interactive Textbook! With this unique textbook tool, as the professor speaks in the CPA course video, you get materials presented to you in real time so you never miss a thing! Take notes, create bookmarks, and view additional lessons and files at any time. Plus, add an extra level of CPA insight with community notes, questions, and related video links. Add 5 to 15 points to your score! 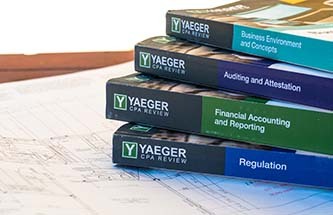 The YAEGER CPA Review CRAM course is designed as a final wrap-up, to assist CPA candidates a few weeks prior to taking the exam. No matter what review course you have taken for your initial study, our CRAM program will help you identify your strengths and weaknesses before you go in to take the exam so that you are fully prepared when you take your exam. Let our CRAM course help you pick up those extra points that will make the difference! Listen-n-Learn as our instructors methodically go over all of the key concepts you need to understand for the exams. Great for exam preparation on the go! Download any section of the lecture individually or review them all at once! Once downloaded you can burn the MP3 to a CD, put it on an MP3 Player, and more! Unlimited playback of key exam concepts! Download individual sections or the entire series at once! Burn audio to a CD or download to your mobile device and listen on the go! Yaeger CPA Review flashcards are the best way to study for your exam on the go. Easily study all of our courses (FAR, AUD, REG, & BEC) right from your phone! Whether you're waiting in line at the grocery store, taking a ride in a cab, or enjoying the comfort of your own sofa - Yaeger CPA flashcards are now just a touch away. Our state of the art flashcard application will allow you to easily flip through cards and flag cards for later view. We offer our flashcards in 3 unique ways, learn what's best for you below! Over 2000 cards to study!! Call 1-800-824-2811 ext. 6 or email sonny@yaegercpareview.com to set up an interest-free payment plan. Learn more about financing here. 100% AICPA Blueprint Integration -- Yaeger CPA Review teaches directly to the test! Bundle and Save: Buy the 4-Part course now and save $111 automatically! When you purchase the Full 4-Part Course bundle or a Single Course bundle, all related products (including all-access bundles) are already included.